In Motive: Body, there are following skeleton markersets for biomechanics tracking applications. 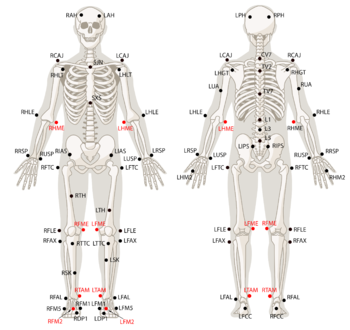 When attaching the markers, reference the skeleton avatar from the Skeleton Pane for relative locations. Then refer to the corresponding markerset pages, or related reference materials, for additional descriptions on where each marker must be placed on the subject. Biomechanical analysis requires advanced computations in order to obtain most accurate biomechanical data. However, joint angles generated and exported from Motive are intended for basic visualization purposes only and should not be used for any type of biomechanical or clinical analysis. To use captured tracking data for such applications, the 3D markers data must be pipelined down to a biomechanical analysis software (Visual3D or The MotionMonitor) for further analysis. This page was last modified on 26 July 2018, at 09:11.